Two-time presidential loser Mitt Romney is the Great Mentioner’s main squeeze right now, a regular Page One Pin-up Boy. Start with this front-page story in Saturday’s Boston Globe (mercifully below the fold). “Oh, no, no, no. No, no, no, no, no. 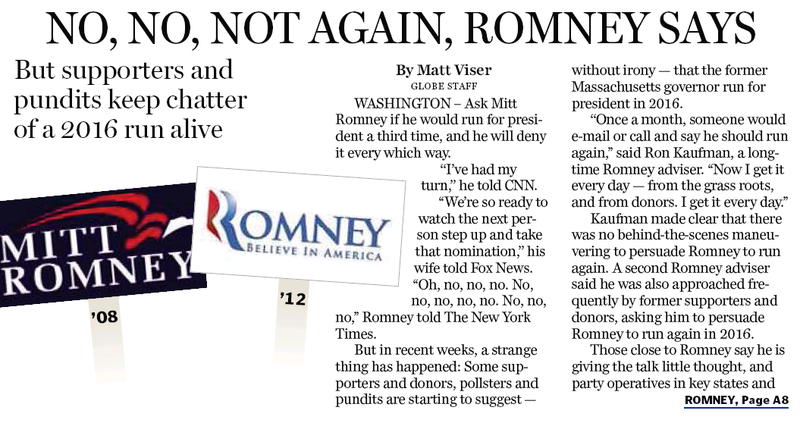 No, no, no,” Romney told The New York Times. Romney, not surprisingly, says all the right things in pooh-poohing the possibility he could go for the hat trick, while adding a few Mitticisms along the way that are as awkward as he is. 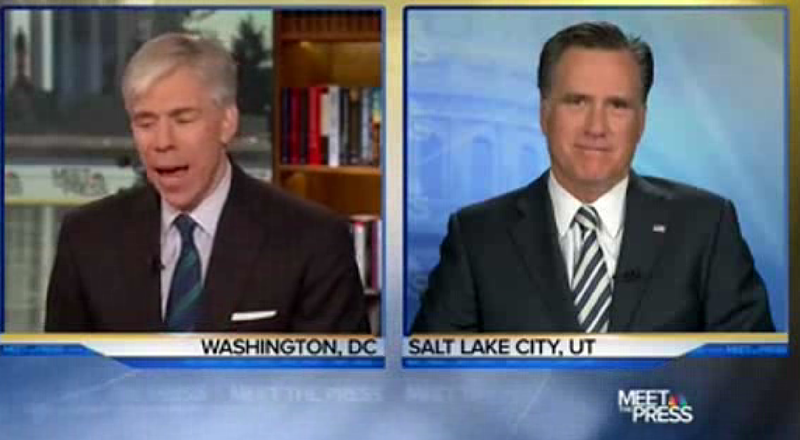 Mitt Romney on presidential losers: “Mike Dukakis, you know, he can’t get a job mowing lawns. We just brutalize whoever loses.” (http://b.globe.com/1fodGJN) Haw haw haw! Michael Dukakis has been an important part of the Northeastern community for many years. But why let the facts get in the way of a bad joke? 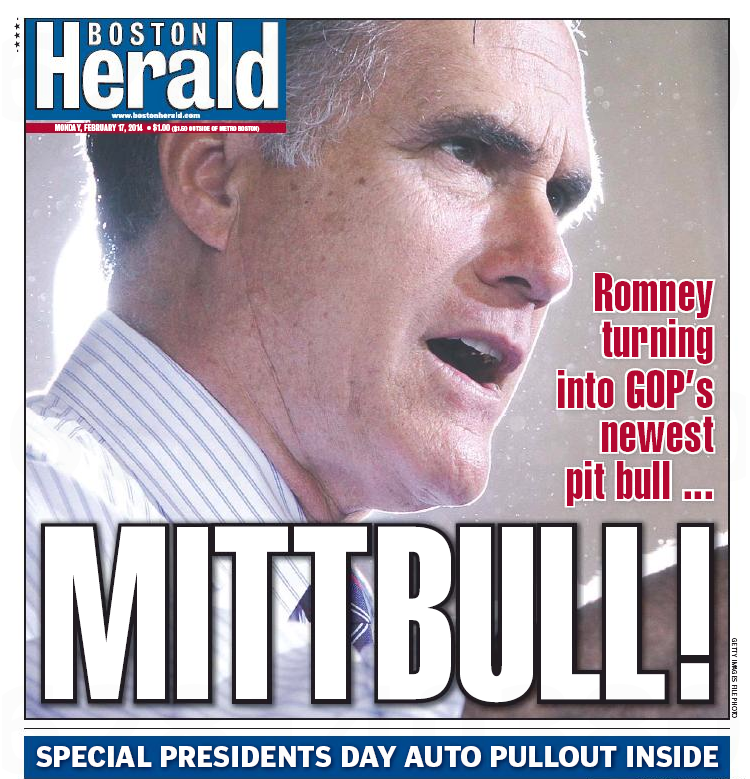 Crosstown, Romney graces the front page of today’s Boston Herald. The take here is different from the Globe’s, in that the Herald piece operates under the assumption Romney is not a potential 2016 contender. Mitt Romney — the GOP’s uptight 2012 presidential nominee known for his family-man image and awkward sound bites — just might turn into the Republican Party’s top attack dog in 2016. Of course, being himself is what made him a two-time loser. But why get technical about it. This entry was posted on Monday, February 17th, 2014 at 12:50 pm and is filed under Uncategorized. You can follow any responses to this entry through the RSS 2.0 feed. You can leave a response, or trackback from your own site.